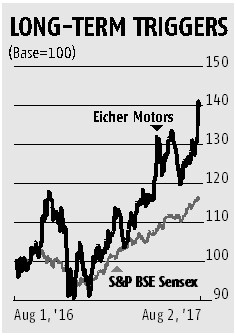 Eicher Motors, already up 40 per cent over a year, hit a new 52-week high on Wednesday. It zoomed past Bajaj Auto as the most valuable automobile stock earlier this week; it has made investors more money than any other large-cap share in the segment over the past 10 years. This is backed by operating performance, with volumes of the two-wheeler or Royal Enfield segment growing 50 per cent annually over six years. Demand has outstripped supply, stretching the waiting period to a little under two months at present. The start of a new factory in Chennai this month might reduce this waiting period gradually. Some of this is reflected in the July sales. 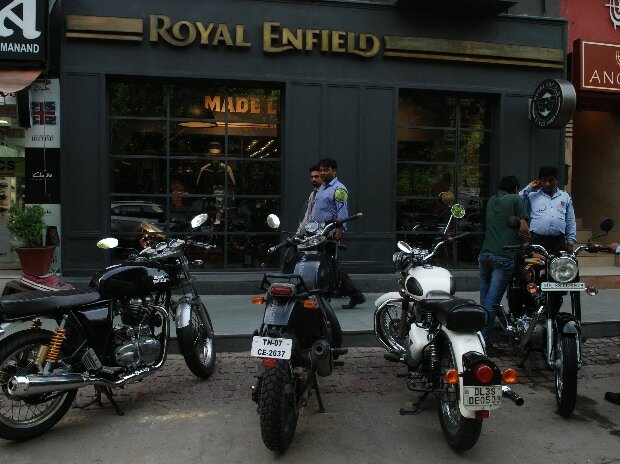 The sales of two-wheelers rose 21 per cent when compared to the year-ago period. Sales in April-July, first four months of the 2017-18 financial year, saw 24 per cent growth over the same period of 2016-17. Volumes for models with engine capacity higher than 350cc is the only reason which is holding back the sales growth. The volume share for this segment has shrunk to a current six per cent from 11 per cent a year ago. Analysts says improvement in the higher than 350cc category is expected (earlier, there were issues with production and BS-IV standards) as the market matures to higher powered bikes. Priya Ranjan of Systematix Shares expects the company to post 20 per cent annual volume growth for the next few years, since it would shortly reach full production levels and there is increasing demand from consumers shifting from 150cc to more powerful motorcycles. Gaurant Dadwal and Vivek Sarin of Nirmal Bang Institutional Equities have highlighted triggers such as strong replacement demand, uptrading of the existing two-wheeler base to premium segment vehicles, strong dealer expansion, rising export and marketing initiatives. All these, they feel, would help Eicher to ensure double-digit volume growth momentum for Royal Enfield in the coming years. The strong volume growth and leverage benefits have so far helped Eicher report a higher operating profit margin at 31 per cent in FY17 versus 15-20 per cent for Bajaj Auto and Hero MotoCorp. Higher revenue growth, backed by pricing power and improving margins, resulted in a higher return on equity of 51 per cent in FY17. The question is whether this trend will continue. Edelweiss Securities' analysts say there are more margin levers in the form of vendor consolidation and scale benefits; they expect a 280 basis points (bps) improvement over the FY17-19 period. The company's other segment is commercial vehicles, a joint venture with Volvo, called Volvo Eicher Commercial Vehicles. Though it gained market share of 100 bps - on the back of new product launches and network expansion in FY17 - analysts said the business had under-performed. While new launches and upgrades will help improve its share of the medium and heavy CV segment, the gains will be gradual, with margins below eight per cent. Higher demand, on the back of industrial and rural recovery, could boost revenue. Despite the stock's re-rating from 20 times the estimated one-year forward earnings to 38 times currently, most analysts continue to be bullish on the prospects and believe a premium to its peers (trading at half of Eicher's valuations) is justified. They say annual volume growth of 20 per cent or more is important for the stock to sustain these valuations. Ranjan says if such a growth rate is achieved, annual earnings growth will be more than 20 per cent, given the pricing power, margin levers and segment growth. 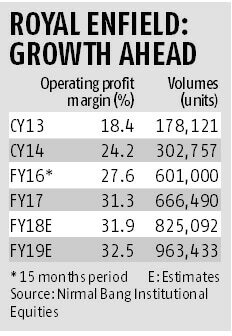 Analysts at Nirmal Bang estimate a strong 25 per cent earnings growth annually over FY17-FY19, led by 20 per cent volume growth annually and margin expansion over that period. The stock price could double from here, but given the current valuations, investors will need to keep a four to five-year horizon to gain from the upside.